Its origins are an archaeological riddle worthy of Indiana Jones, but it's also a beacon of an oil-rich future. Welcome to the at least 7,000-year-old Arbil citadel in Iraq's northern Kurdistan region, a stunning walled fortress on a roughly 10-hectare site that some experts say is the oldest continuously inhabited settlement on earth (it's still occupied today, by a single family of 12). After years of stop-start negotiations, the citadel is finally set for a face-lift and likely World Heritage status. Nobody knows who first built the towering castle-city, but it was already famous when Alexander the Great added it to his empire in 331 B.C. Some 1,500 years later, it took an invading Mongol army two tries and a six-month siege to storm it. The list of successive ruling cultures is a history lesson in itself  Sumerian, Babylonian, Assyrian, Sassanian and Ottoman, among many others  and each left its history behind, adding to an archaeological layer cake now 32 m high. Despite pleas from scientists going back to the 1930s, the citadel has never been fully excavated. This is all about to change. The renovation of the ancient hilltop city has become the keystone in an ongoing campaign to turn vast archaeological treasures into tourist dollars for Kurdistan, a stable and prospering region that bills itself as "the other Iraq." Arbil, the capital of the semiautonomous Kurdistan region, is just 340 km north of war-torn Baghdad but may as well lie in a parallel universe. Foreigners can go about freely, crimes and violence against visitors are unheard of, and the most daunting tasks are finding one's way through labyrinthine local bazaars and keeping pace with the legendary Kurdish hospitality. In Kurdistan, against the backdrop of the snow-capped Qandil Mountains, a frenetic frontier economy is being driven by the promise of petrodollars from the region's estimated 25 billion barrels of proven oil reserves. Development is intense. New hotels, shopping malls and housing tracts are springing up to meet Arbil's surging population of more than 1 million. The bars in Ankawa, the city's laid-back Christian quarter, are a heady admixture of oilmen, contractors, journalists, security teams, aid workers and, increasingly, tourists. "I really get the sense that they are coming to see for themselves what Kurdistan is about, in contrast to what we all know and see constantly on the news about Iraq," says Shannon Skerritt, who with his brother and a Kurdish partner operates the Sulaymaniyah-based tour company Kurdistan Adventures. "I guess they want to be some of the first to see this area." The Kurdistan regional government recorded more than 132,000 foreign tourist arrivals in 2009, an almost 150% increase from 2007's figure. The government is bracing for more, opening a $400 million state-of-the-art airport in Arbil and slashing fuel costs to attract airlines. Most regional carriers are making daily flights; Lufthansa and Austrian Airlines fly four and three times a week respectively. Rotana Hotels and Millennium and Copthorne Hotels are developing sites in the city, and a free 10-day tourist visa is available for most countries' citizens. While all of these developments are sure to attract travelers, local officials feel that archaeology is the ace in the hole for Kurdistan's fledgling tourism sector. "We have amazing archaeological sites that are equal to anything in the world," says Arbil Mayor Nihad Qoja. "If we can vitalize these sites, believe me, each year millions of people will visit Kurdistan." This is where the citadel comes in. In late June, Kurdish officials and UNESCO representatives inaugurated the first renovations in a multimillion-dollar effort to bring the slumbering city back to life. In a shortlist of possible new World Heritage sites, UNESCO described the citadel as "one of the most dramatic and visually exciting cultural sites not only in the Middle East but also in the world." The first steps will be small, says Dara Yacoubi, an architect and head of the Kurdish reconstruction team. Initially, a few dozen of the citadel's most valuable houses will be restored. Later, similar work will begin on its three mosques, plus gates, gravesites and a central hammam that dates back to 1775. 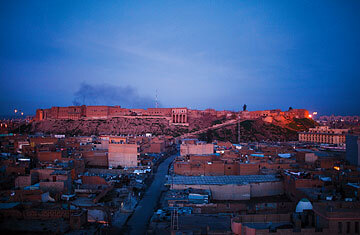 In three years, Yacoubi expects the citadel to be a significant tourist attraction. Within 10 years, he envisages museums and boutique hotels. Along with the renovations, the first major excavations on the citadel grounds will be conducted. Regular rumors of treasure chambers, temples and royal tombs are still just that, so experts are panting to dig in. "The Arbil citadel has played a very great role in the history of the city. In fact, for many centuries it was the city," says Kanan Mufti, general director of Kurdistan's Ministry of Culture, who was born in the citadel and traces his family's roots there back 500 years. "It is only fitting that the citadel will have a role in the future of Arbil." Says Mayor Qoja: "The city's future is bright. We have mountains and rivers; we have oil reserves that haven't even been tapped." For him, tourism will be another great boost to the local economy. So while Arbil's walls may have withstood some of history's greatest armies, the hope now is that they will be swarmed by a new generation of invader  the free-spending tourist.